Serge Lebel’s discovery of small meteorites in a 200,000 year-old site in France has got me thinking once again about the critical role that other such space debris has played in human history. So I took another look last night at a wonderful paper that Robert McGhee, a former curator at the Canadian Museum of Civilization, and one of the world’s great experts on ancient human cultures in the Arctic, wrote about the influence of the Cape York meteorite on Arctic history. 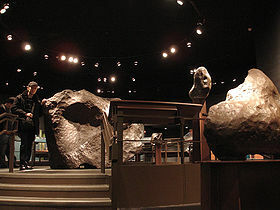 According to Danish metallurgist and meteorite expert Vagn Buchwald, the Cape York meteorite produced the largest shower ever recorded. Falling to earth in northern Greenland, the ten known fragments littered a strewnfield measuring 100 km NW-SE. The largest of the iron-rich masses weighed 30 tons, the smallest some 250 kg. Now here is where McGhee’s ideas come into play. Archaeologists have long known that the ancestors of today’s Inuit originated much further to the west, quite likely along the coasts of the Bering Sea. But some time in the 12 century A.D., these ancestral Inuit, known as the Thule, migrated swiftly into the eastern Arctic. The big question has long been what drew them eastward so quickly? Over the years, researchers have proposed a variety of theories, from climate change (the migration coincided with the Medieval Warm Period) to sharp increases in Thule populations. But McGhee proposed a very different theory. He suggested that the Thule hurried into the Eastern Arctic in order to lay their hands on a major source of precious iron. In all likelihood, he suggests, the Thule had earlier acquired bits of iron by trading across Bering Strait, but this would have been a drop in the bucket compared to the wealth of iron in the Cape York fragments. Moreover, it seems likely that the Thule learned about this iron source from an another Arctic culture, the Dorset, who were lightly scattered across the region. In McGhee’s view, this knowledge would have been sufficient to lure some bands eastward. If the Canadian archaeologist is right, the course of Arctic history was altered forever by a hunger for iron, and metal from the sky. about but so interesting that I want to know more. Thanks, Sallie. There’s just so much fascinating research out there, and much of it falls through the cracks of the traditional media. I’m trying to catch some of this. ← Did Ancient Humans Witness An Asteroid Explosion 200,000 Years Ago?